Bull City Burger and Brewery was not only a founding GreenToGo restaurant, but they volunteered to be in Phase 1 of the GreenToGo launch. They were one of 5 restaurants to offer GreenToGo from day one. And, we’d be remiss if we didn’t also give them credit for going STRAW-FREE. These guys walk the talk and we’re so grateful to have them on our side in this #ReuseRevolution! So, head on over to Parrish Street and enjoy a pasture-raised, most delicious beef burger (or a veggie burger, if that’s more your style)! Get your take-out totally trash-free in GreenToGo, or dine in and take those leftovers home with zero trash-guilt! Step 1: Login to your GreenToGo account on your phone so that the “Active Member” page is present and order food at the restaurant counter, telling your cashier “Packaged in GreenToGo, please!” while showing them your “Active Member” screen. Step 2: The cashier will provide a GreenToGo check out sheet so you can check out your box(es). Step 2 Option 1: The easiest way to check out your box is to use a QR code reader (that you already downloaded on your phone). Just scan the code provided. That will take you directly to the G2G checkout page! Step 2 Option 2: You can also go to app.durhamgreentogo.com/locations in Safari or Chrome and enter the “Location Code” provided on the sheet the cashier handed you. Step 3: Receive your delicious food in a GreenToGo container and take it home with you to enjoy! Give it a quick rinse (but no need to scrub it!) when you’re all done with the food. 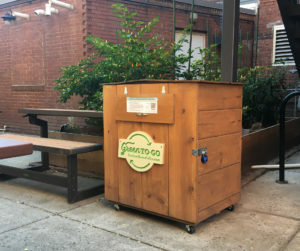 Step 4: Return the container to any GreenToGo return station (at all participating restaurants, the Scrap Exchange and Fullsteam Brewery) and check it in by either scanning the QR code on the return station, or logging into app.durhamgreentogo.com/locations and entering the Location Code on the return station. 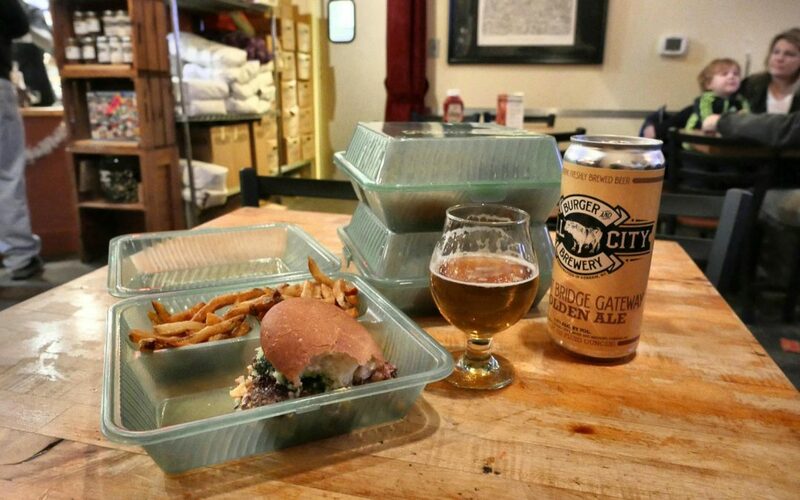 If you’re dining in at Bull City Burger and Brewery, ask your server for the Green2Go container for leftovers and follow the above steps 2-4.
Who knew trash-free takeout could be this easy? Well, we were pretty sure it was possible and thrilled to see it working!